Last night was the Ska Luau IV at the House of Blues! It was an awesome show, and I’ve learned about some new awesome bands. The show began with Magnolia High School’s Polynesian Dance Troupe. I only took one photo, and it was pretty bad. Sorry! They had men and women, but they danced separately. They did dances from a variety of Polynesian cultures. Pretty interesting. CodeName: Rocky was the first band to perform. I hadn’t heard their music previously but was very impressed. They had a great variety of instruments too. Sax? Of course. Trumpet and trombone? Yep. French horn?! Heck yeah! Save the Swim Team described themselves as “the most screamo ska band,” and I suppose that was true. I liked the ska, but didn’t particularly like the screamo parts. However, they did mesh it pretty well, and I could understand why they’d have a lot of fans. This was actually their last show ever. Suburban Legends was absolutely amazing. I’ve actually been listening to their music all day today now because I’m hooked. The lead singer was a lot of fun, but their guitarist was pretty charismatic too! Their brass section consisted of two trumpet players and a trombone player. The band also danced together with great choreography. I wasn’t expecting it, but it was so amazingly good. Starpool came on the stage wearing tiki masks before starting the set and releasing the confetti that’s in the photo at the top of this post. Besides throwing bags with chocolate penises into the crowd (some sort of joke from previous concerts I’d assume), they also threw these glowing sticks. They played an amazing set full of a lot of songs that I loved. I sang along, danced, jumped, and was pretty tired at the end honestly. And what concert would be complete without a band member crowd surfing in a giant ball? That was pretty cool. Starpool ended the show with their cover of Shout that I absolutely love. This might have been my favorite concert I’ve ever attended. If not, it would be the show with the Aquabats and Starpool, so I guess that’s good for Starpool anyways! Hopefully Friday’s Reel Big Fish show at the same venue is as awesome. This entry was posted in Events, Journal, Music, Photos and Screenshots, Shows and tagged codename: rocky, concert, downtown disney, house of blues, house of blues anaheim, magnolia polynesian dance troupe, music, save the swim team, ska, ska luau, ska luau iv, starpool, suburban legends on December 31, 2013 by TheUser. Friday and Saturday provided a great start to my weekend. I began Friday evening with a martini with the “Beet” that was infused and given as a gift to me by my friends. I did have to buy martini glasses and some other things, but it was worth it. Duncan was going to Dave & Buster’s for drinks with some friends, so I went with them. I definitely had a good time. 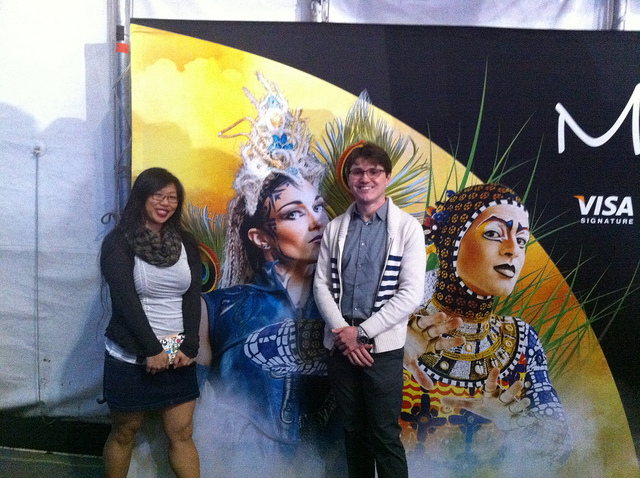 Saturday afternoon, gem and I saw Totem, a touring, Grand Chapiteau Cirque du Soleil show. It’s about the evolution of humanity. Totem was an amazing show. There’s not much of a reason to explicitly recommend seeing it, because I’d always recommend all Cirque du Soleil shows. I particularly enjoyed the ring and trapeze artists. Their strength (and balance and coordination) is just amazing. Before the show when some of the artists were interacting with the audience, one, who I’ll call the ringmaster although I’m not sure it’s accurate, was near us. Everytime the ringmaster looked our way, gem would wave enthusiastically. When he got closer and was a few rows from us, he almost walked away, but after gem waved again, he came over to us. He got really close to her until his nose touched her nose. After a few seconds he jerked back and booped her nose, attempting to put a clown nose on her. It didn’t stay, so he tried again, slower, and then told her she a small nose. She lifted her glasses, pushed the nose on, and then lower the glasses on it. During the show, every time the ringmaster came on stage, gem would whisper, “that’s my buddy!” And that’s how gem got her clown nose! The waitress missed my glass when refilling my water, getting my shirt pretty soaked as well as my pants and phone. Everything was okay; she was very apologetic, and I really didn’t mind too much. She gave me dessert for free – deep fried green tea ice cream! It was very delicious. I somehow doubt Sunday can live up to Friday and Saturday. This entry was posted in Art, Events, Food, Journal, Photos and Screenshots, Shows and tagged beet, cirque du soleil, drinks, foursquare, sushi, totem, zenko on December 29, 2013 by TheUser. After a week of eating the lunches from the Aquabats’ Pizza Day, I was ready for Saturday’s concert at the Fonda Theatre in Los Angeles! Emily’s Army and Kepi Ghoulie were the opening bands, but of course I was there for the Aquabats. You can’t make it out in the photos, but I’m wearing a blue rashguard and gem’s wearing a purple rashguard. I opted to leave my anti-negativity helmet and power belt in the car for ease of jumping around and getting slammed by people. There’s always a game of Duck, Duck, Goose going in the back before the bands start playing, and this show was no exception. It’s pretty cool seeing the same fans at every show. I particularly remember the guy who wears a cool Aquabats lab coat, who I believe said he goes by Skibz, as well as the young woman with kids who was then the pregnant woman in the pink rashguard and is now the woman with the young baby! Very cool. Kepi Ghoulie was really good; I enjoyed them a lot. Unfortunately, their bass player couldn’t make the show. They asked if anyone could play bass, and, well, Eagle “Bones” Falconhawk can! The band released a bunch of balloons and streamers into the audience and even threw presents into the crowd. gem got one; it was a toy car! We each also got a guitar pick from Kepi Ghoulie! Finally the Aquabats took the stage! Sorry for such a plain, boring photo, but the Aquabats threw beach balls into the crowd, and I got one. I didn’t take a picture of it until I got home. It’s probably about a foot in diameter. Pretty cool! Someone threw a red sweater onto the stage, so the Bat Commander decided to wear it before proceeding to sing Red Sweater. After that song, the Aquabats were attacked by an evil crustacean! Don’t worry though. They managed to defeat him with the help of name-calling! Crash also recited a little poem that led into Super Rad. He also borrowed this cute hat from the girl standing to the left of me. I didn’t mention it, but it’s probably worth noting that I was right at the front and in the center. It was a sweet spot. I also got to enjoy chatting with security between sets. Later the Aquabats got into another shorter fight but then found themselves hungry. Luckily, when they asked for a snack such as a granola bar, someone in the audience actually had one. Multiple granola bars, a Clif Bar, and a bag of Pepperidge Farms Milano Cookies were all thrown onto the stage. The Aquabats took a snack break, sang Snack the Night Away, a parody of Van Halen’s Dance the Night Away, and then… all licked the Clif Bar before throwing it into the audience for some “lucky” fan to eat. 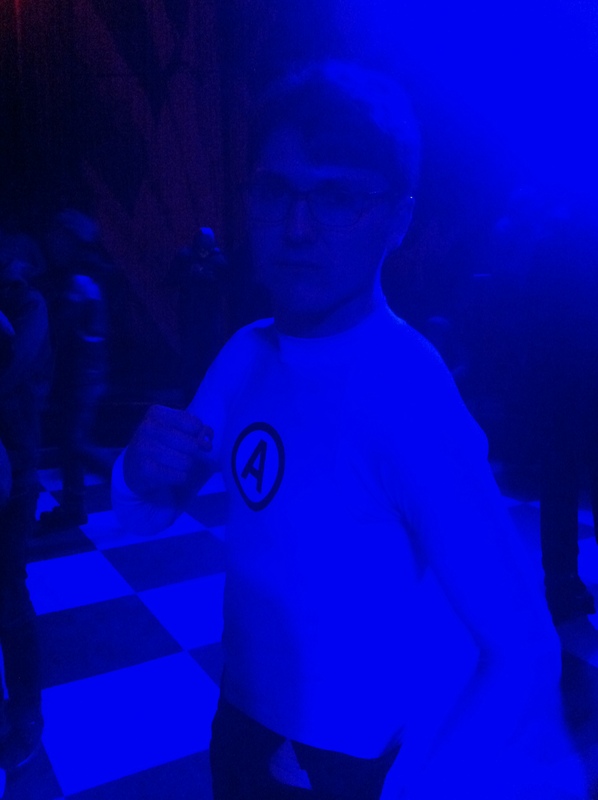 Near the end of the show, the Aquabats left but came back like they usually do. When they returned, they were in Christmas costumes! Ricky Fitness and the Bat Commander traded roles, letting Ricky sing while the Commander played the drums. Funny thing – it sure looked like the Bat Commander had four arms. I was hoping to get a photo, but I couldn’t capture it. And no, there was no trick with lighting. Evan Sinclair, the Aquabats Super Show music supervisor and stage manager was crouching behind him while reaching around and playing drums. Weird but funny. Speaking of Evan Sinclair, he came out at the end to sing a little Hanukkah song before the Aquabats sang a Christmas song. It was a fantastic set, and it started off so strong too! After the theme song, they went right to one of my favorite songs from Charge! and then Martian Girl (whoa whoa whoa whoa whoa). 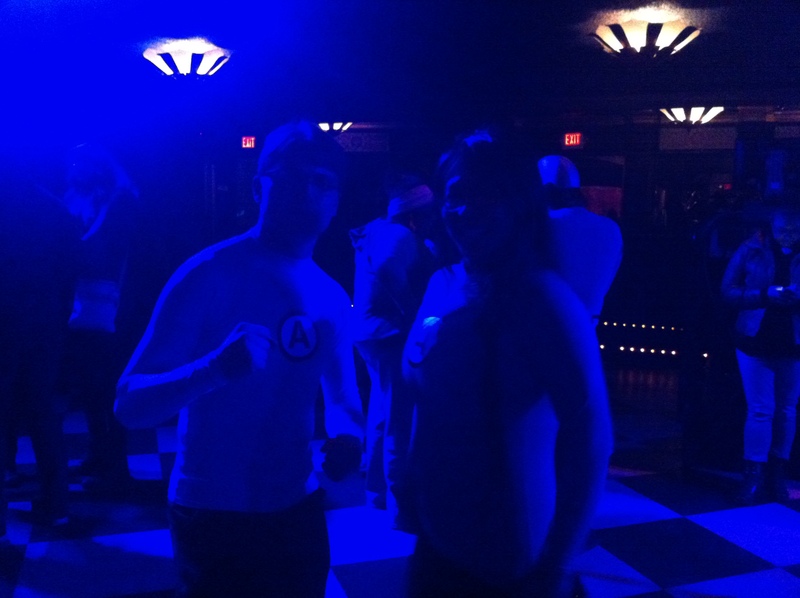 This entry was posted in Music, Photos and Screenshots, Shows, The Aquabats!, Videos and tagged aquabats, christmas, emily's army, fonda theatre, kepi ghoulie, the aquabats on December 8, 2013 by TheUser. This entry was posted in Food, Journal, Photos and Screenshots and tagged aquabats week, dinner, lunch, pizza on December 6, 2013 by TheUser. This entry was posted in Food, Journal, Photos and Screenshots and tagged aquabats week, burrito, burritos, burritos in a bag, dinner, lunch, sloppy joe, sloppy joes on December 6, 2013 by TheUser. This entry was posted in Food, Journal, Photos and Screenshots and tagged aquabats week, cheeseburger, cheeseburgers, chocolate, chocolate milk, dinner, food, hamburger, hamburgers, lunch, milk on December 4, 2013 by TheUser. This entry was posted in Food, Food I Prepared, Journal, Photos and Screenshots and tagged aquabats week, dinner, food, lunch, taco, tacos, tuesday on December 3, 2013 by TheUser. This entry was posted in Food, Food I Prepared, Journal, Photos and Screenshots and tagged aquabats week, dinner, food, hot dog, lunch, monday on December 2, 2013 by TheUser.